Each month, Ananth (a.k.a Rango) and I will hit up a local restaurant and write about one specific dish. Once the plate reaches the table, there’s absolutely no talking about it or any facial expressions. We go home, write separate reviews, and post them right here. 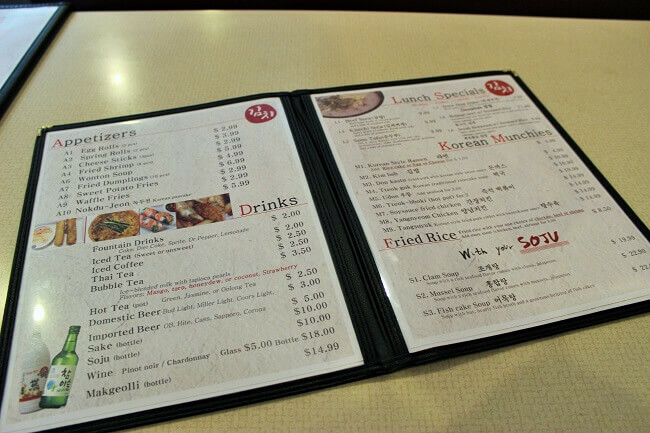 We decided to check out Kimchi Korean Restaurant this month. This episode of Rango & Rib is brought to you by fall weather, a bromance, and my love for all things Korean food. 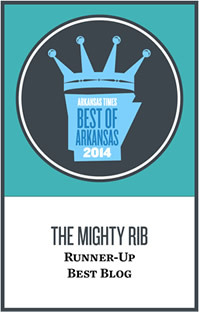 Kimchi is located where the old Vang Lang Vietmanese restaurant was across from UALR on S. University. I ate here with my wife about a month and a half ago, and the minute I tasted the Kimchi stew, it was one of my favorites. Fast forward to last week, when TMR and myself made a quick lunch stop. 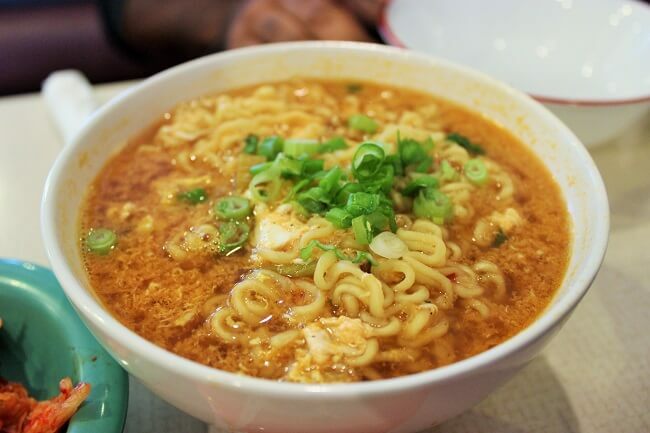 We split a bowl of the Kimchi Stew and ordered a bowl of the ramen, because ramen. I’ll stick to the Kimchi Stew, because it was undoubtedly the star of the show. The restaurant doesn’t strike you on first glance like they are going to put an emphasis on presentation, but when the bowl of stew came out bubbling hot in a stone bowl in all its glory, you realize they know what they are doing in the kitchen. The soup was piping hot, with a perfect balance of spicy, sour, and salt. The fermented flavor from the kimchi is really what stood out to me as unique and incredibly delicious. The delicious tofu really absorbed the flavor of the broth, which is always nice. The pork meat was mostly fat and cartilage, but even that absorbed so much flavor that I can’t complain. This bowl of soup was flat out damn good food. I definitely plan on being back for more. Truth be told, I’m not the biggest fan of kimchi. I’ve had it several times over the past few years but have never been particularly drawn to the taste of fermented cabbage. So when Rango suggested we go to Kimchi Korean Restaurant for some Kimchi Stew, I wasn’t exactly doing back flips. But I’d been to Kimchi once before, was looking forward to a second visit, and trust when Rango recommends a dish. Simply put … the Kimchi Stew was a winner, and it all started with a killer presentation featuring a small stone bowl filled with bubbling hot broth. If that doesn’t get the old taste buds flowing, nothing will. The broth was a rich red color (probably from a red pepper paste) and had a nice spicy and sour taste to it. There was obviously no shortage of kimchi in the bowl and the delicious pieces of soft tofu really made the stew. My only knock on the dish? It needed more pork. For $10, I’d say the stew (which came with white rice) was an adequate portion, but as much as I enjoyed the dish, it’s something I’d definitely prefer eating in a communal setting. A little went a long way for me, so I was especially glad to be sharing the bowl with Rango. We also ordered some $5 ramen, which ended up being pretty solid. Think of it as a ramped up version of what you make at home. Nothing more, nothing less. 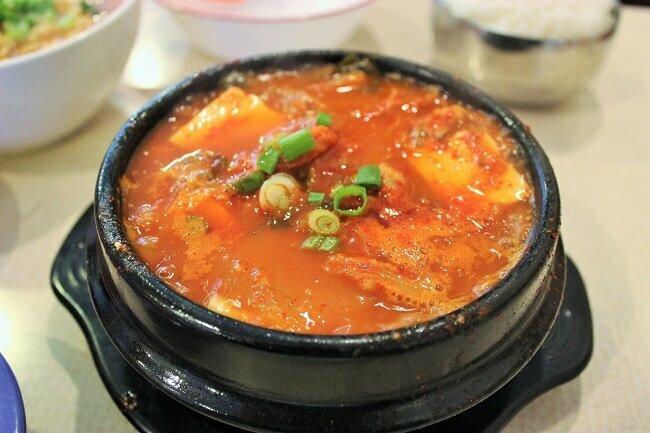 Our service was fast and attentive, and although the atmosphere and décor of the restaurant are fairly dreadful and sparse, these aren’t things that would keep me from a return visit to Kimchi Korean Restaurant.